I drove the pin out using using an 1/8" pin punch and a 1 lb hammer. A 5/32" punch with a 2-3 lb hammer would have been easier. This pin is tight! 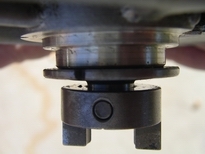 Remove the two screws that hold the pressed-on bearing. DO not turn or pull the shaft bushing! The gear and these 2 screws are all that hold the shaft in. 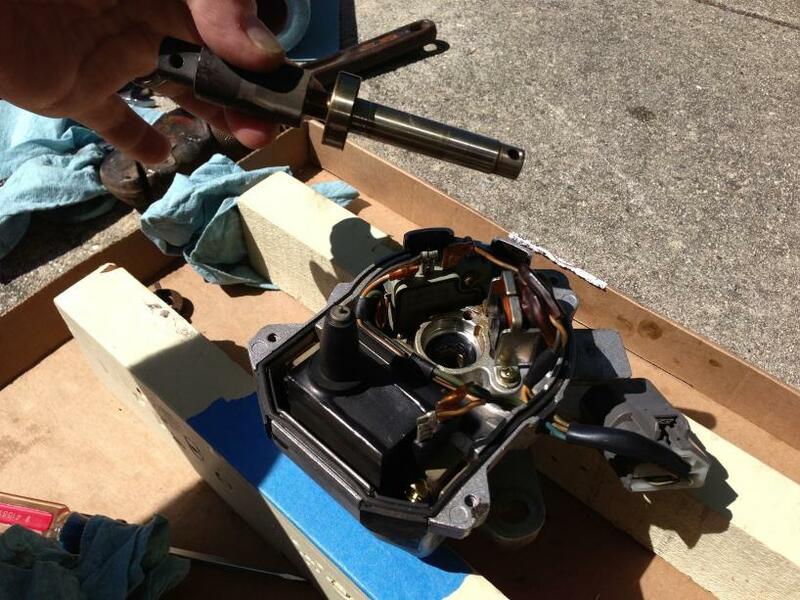 Reverse the steps for reassembly. I got my seal and o-ring from Red Auto Rehab on Ebay for $10 delivered. BTW, the bearing was marked Japan NSK 6000DU. thanks a lot it's very important detail for me . Good post that will help someone here in the forums. Very good post , info , and pictures for all to see and learn from.. Thank you! 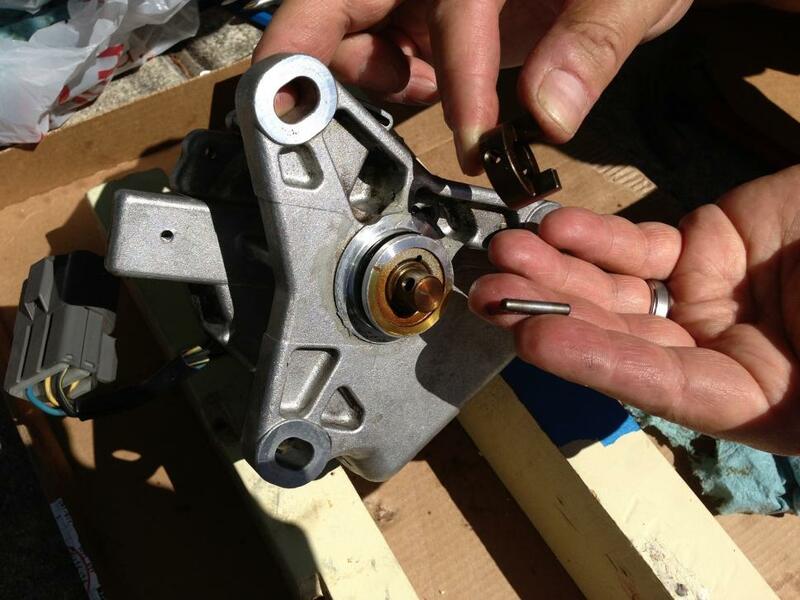 To each and everyone for posting the photos and step by step instructions for replacing the inner seal. I found a YouTube showing inner seal replacement for 1996 and 1997 Accords with TEC distributors. The video shows removing a circle clip and the shaft simply falls out once the circle clip is removed. The video mentions the Hitachi distributor has some differences, however, this major difference is not mentioned. I found a SKF seal (part number 692265) locally (Mount Vernon, Indiana) that is very close to KOK 3286. The dimensions for the SKF are 12mm X 22mm X 7 mm. The dimensions for the KOK 3286 are 12.45mm X 22mm X 6mm). I am not concerned the seal is .45mm (0.018") under-size for the shaft . I am concerned with the extra 1mm in thickness after seeing the photos. Is there any space between the seal and the bearing? Will the extra 1 mm prevent the bearing from seating properly? I found several hits for Nissan that use a Hitachi Distributor. 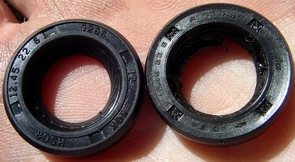 The size of the seal is exactly the same as the KOK 3286, however, the Nissan seal state CCW. 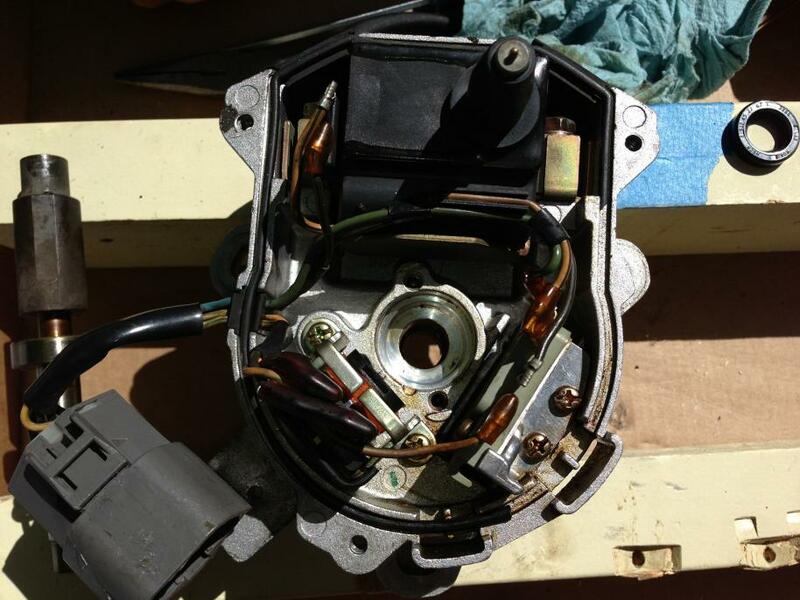 Several Hitachi links for the Honda Accords state clockwise rotation for the seal. The SKF seal does not specify counter clockwise or clockwise rotation. A local bearing supply in Evansville, IN found a seal with nearly the same dimensions in the Timken line, however, it was listed as OEM and unavailable for sale to the end user. 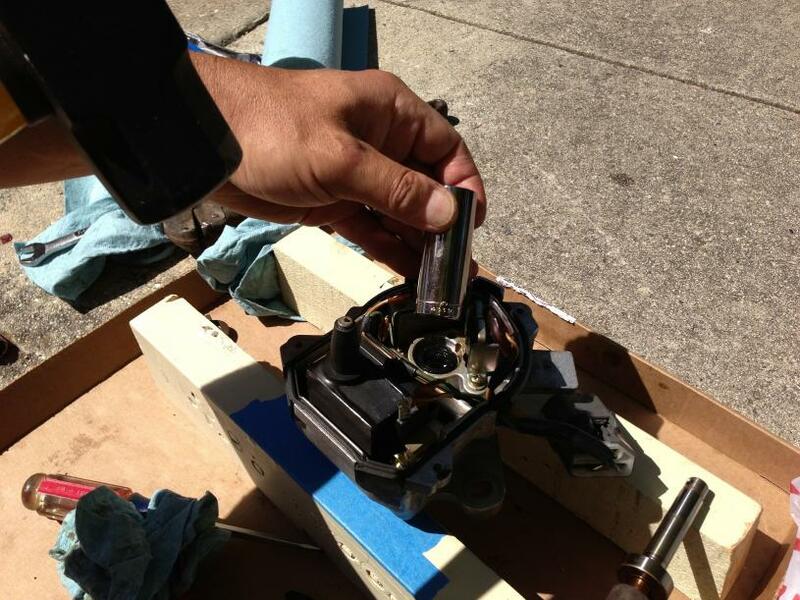 If you have the same distributor, why don't you buy the $6 seal from eBay like we did? As far as thickness, if you look at my third photo it will show how low the seal sits within the seating chamber ... looks to be comfortably more than a millimeter below the bearing seat. The distributor shaft is not subjected to any thrust forces when operating, but the bearing is held in by those two set screws ... so I would think as long as the seal doesn't sit above the bearing seat and press against the side of the bearing, you should be okay. I don't think the size of gap in there matters. I would be a bit concerned about the smaller inner diameter ... sure it's just rubber, but under higher pressure may wear more and/or generate more frictional heat. I don't know if there is a limit to which you should stretch rubber seals .... I guess worst case the seal will start leaking again sooner than later, so you'll just have to watch out for it. My suggestion, though, is to buy the $6 seal on eBay and be done with it for another 15 years. Last edited by jkowtko; 07-12-2013 at 10:42 AM. Thank you for your kind reply. I simply do not purchase items from ebay. I am not concerned the diameter is eighteen thousands of an inch smaller in diameter. I was not certain the amount of gap between the seal and the bearing. The photo shows what appears to be a gap, however, I was not certain there is a millimeter or more gap. My concern was the seal and bearing might be in direct contact because my seal is 1mm thicker. 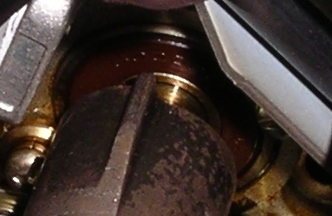 This might cause the seal to leak or the friction could melt the seal. 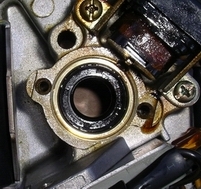 I will post the final outcome following the replacement of the outer o-ring and the inner seal. 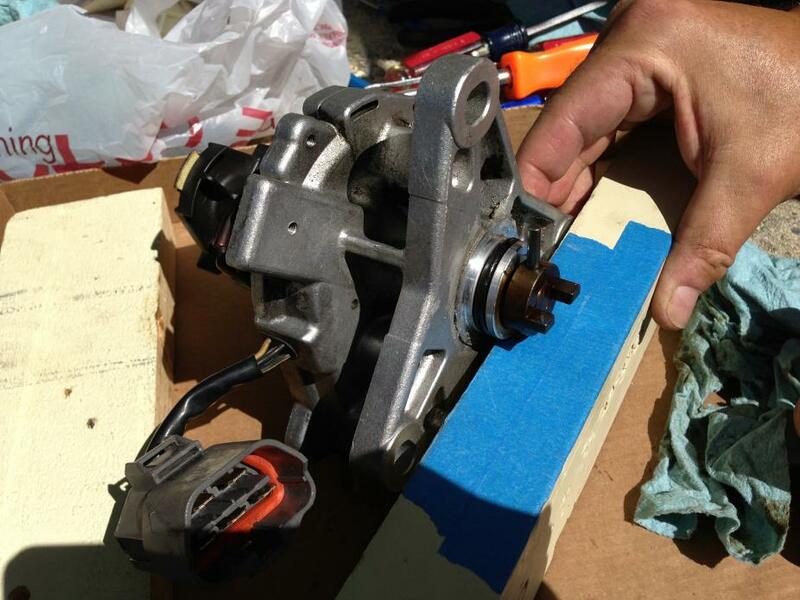 The next step will be the replacement of the vtec solenoid seals. I hope this will cure the oil leaks on the distributor end of the engine. Thank you again for your prompt reply. I simply do not purchase items from ebay. Here ... Reds Auto Rehab, solutions for common automotive problems. you can call them and use your credit card to order over the phone. No need to go through eBay. 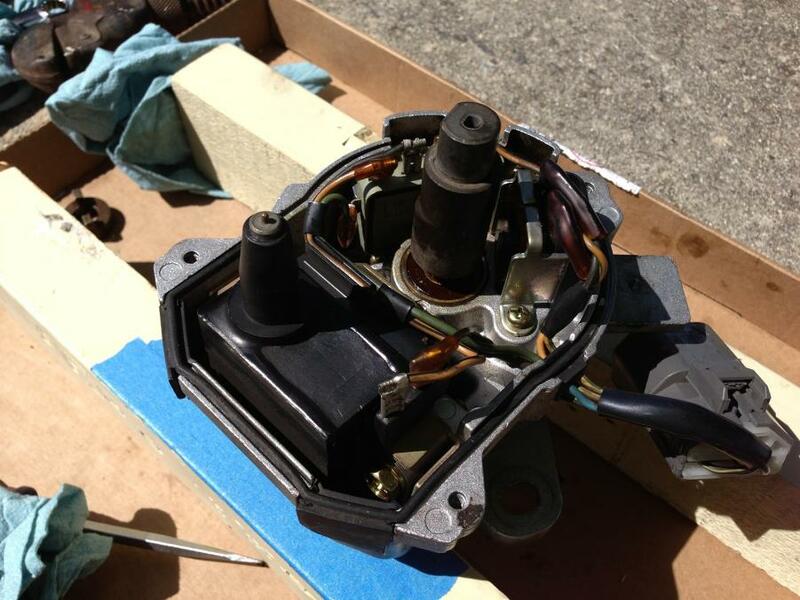 The next step will be the replacement of the vtec solenoid seals. I also suggest buying some silicone grease (looks like vaseline, but isn't) to put on these seals before you install them ... helps guarantee easy install and a good seal ... and it can be picked up from the hardware store for a few bucks in the kitchen faucet dept.